The DeKalb County contingent to the 2018 state tennis playoffs consists of 17 teams including four region champions as play gets underway today (Tuesday). The defending Class 5A champions Chamblee Lady Bulldogs lead the way as they host Decatur today at 4:00 pm at Chamblee High. Chamblee has reeled off 17 consecutive wins this season including three straight to win the Region 5-5A crown. Chamblee went 25-0 in 2017 on the way to the state crown and has a current streak of 42 victories heading into their Class 5A first round match. The team is led by sophomore No. 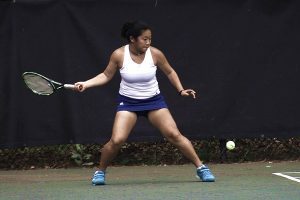 1 singles player Madison Trinh who is 9-0 overall (7-0 at No. 1), No. 2 singles player junior Grace Pietkiewicz (11-1 overall, 8-1 at No. 2) and No. 3 singles player freshman Neena Katauskas (9-1). Trinh took over at No. 1 singles when senior Olena Bilukha suffered an ankle injury that has prevented her from playing much of the season. Bilukha has won 36 consecutive No. 1 singles matches over three years and 53 singles overall including 17-0 as a freshman. Bilukha is set to play No. 1 doubles with junior teammate Madeline Meer in the state tournament. The pair is 6-0 as a team. Junior Emily Ershtein and freshman Lila David are teaming up at No. 2 doubles. Other Class 5A girls’ teams in action today include Arabia Mountain (5-7-1) playing Grady at the Piedmont Park Tennis Center at 4:00 pm and Southwest DeKalb (8-12) traveling North Springs at 4:30 pm. Arabia Mountain (5-7) travels to Grady for a 4:00 pm first round match in Class 5A boys’ action and Dunwoody (11-7) is at Winder-Barrow for a 3:00 pm Class 6A boys’ clash. The Stone Mountain boys’ and girls’ teams are on the road at Calhoun for Class 3A first round play set for 3:30 pm to round out today’s schedule for DeKalb teams.